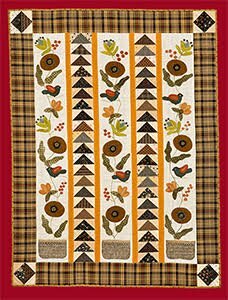 A lovely wool and piecing combination featuring lovely fall colors. Sweet little birds, flowers and flying geese make up this charming wall hanging. Norma Whaley will teach her techniques for wool applique. Kit is available for purchase. The kit includes all of the wool and fabrics for this wall hanging, plus the pattern. The flying geese are pre-cut. You just need to provide your favorite thread for the applique - DMC, Valdani etc. Cost for kit is $78 payable to the teacher. Cost for kit is $78 payable to the teacher. Kit is available for purchase. The kit includes all of the wool and fabrics for this wall hanging, plus the pattern. The flying geese are pre-cut.